Happy are those who can be kind in understanding the attitudes of others; they may be taken for fools but that is the price of charity. During the holidays, some of our Yr 7 and 8 basketballers competed in the Network Waitaki Intermediate Basketball Tournament held at the Waitaki Rec Centre. Teams from Canterbury, Otago and Westland competed in this tournament and it was an opportunity for some rep teams to have some experience. 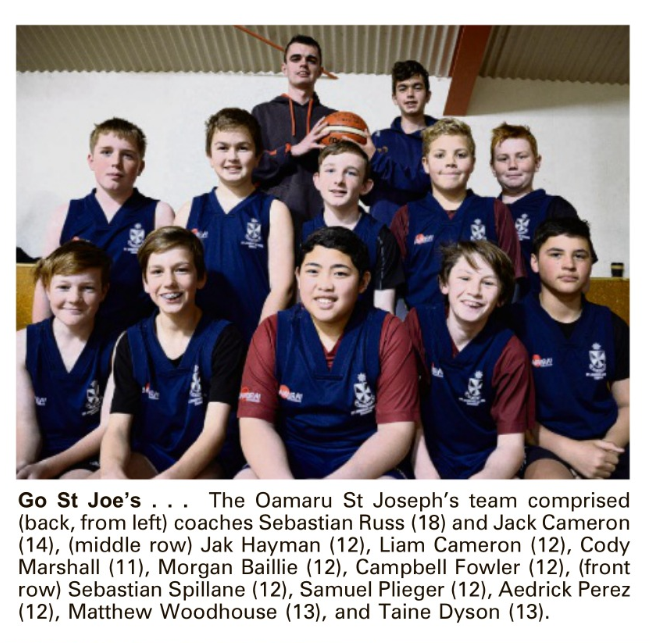 St Joseph's entered the boys development grade and due to a very tough draw where they played 4 games in one day and 2 very late night games on Friday and Saturday nights and some close games, they finished just with one win. The coach was really proud of the boys as they played really well and did not give up and she saw heaps of improvement during the tournament. We had 2 girls, Elenoa Asi and Anika Winders play for the North Otago team in which their team won the girls development grade. They had an easier road than the boys and had a couple of close games especially in the final against Mid Canterbury. Thanks to Claire Cameron for organising the boys team. This photo was taken by the Oamaru Mail. These forms need to be returned back by tomorrow in order for entries to be sent away next week. We still require a parent to stay with the children during this tournament. Please advise the office if you have moved or changed your contact details recently. This excerpt is taken from the Waitaki Football Facebook page. 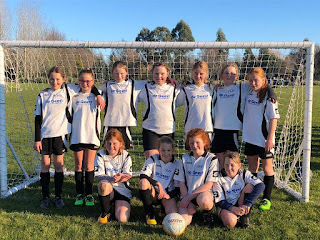 (Congratulations to Football Waitaki 10th grade girls team who played in their first rep tournament in Kaiapoi during the holidays. The girls played really well and had a great time. They won 3 games (5-0, 4- 0 and 2-0) drew 2 all and lost game 0 to 1. 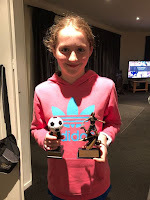 Zara Davies was the teams MVP and she also won the silver boot - 2nd highest goal scorer in the 10th grade competition). St Joseph's had Hana & Zara Davies and Annalise Kilgour playing in this team. Congratulations Zara on receiving the silver boot. Water Safety lessons start on Monday afternoon for the junior school so please remember their togs and towel. The children will be bused to and from the pool and parent helpers are to meet at the pool. These parents will help with the changing into and out of the swimming togs. Miss Tangney/Mrs Klenner and Mrs Misiloi's classes swim at 1.30 pm and Mrs Brookes and Mrs McRae's classes swim at 2.00 pm. The lessons are about water safety, water confidence and the children will be doing some lessons but they are not the same as the after school swim lessons. Below is the timetable for parent helpers. If you cannot help on a particular day, please notify your child's teacher. Don't forget to book an interview time with your teacher if you have not already did it. Remember the students are to come to the interview as well. Go to www.schoolinterviews.co.nz and use the code 9dhs6. A reminder about the Kapahaka and Pasifika cultural practises will be combined on Friday afternoons from 3.00 to 4.00 pm in Mrs Misiloi's class. In the month of August, Mrs Winders and Mrs Asi's classes are on Pastoral Care. A notice has been given to the children. Please drop the food off at the office. Thanks. This exciting Ministry of Education funded project has begun in our community. Every Wednesday at Oamaru Intermediate School, Pasifika families are invited to come along and work with your children supporting and encouraging learning at home. Susie Oakes is the parent coordinator and she has established a Facebook page with relevant news and details about the Power Up Plus. Please contact Susie on 022 045 7962 as she has further details or talk to Mrs Misiloi about how you can become involved. Book club orders close on Monday 6th August. There will be no Terrific Thursdays on Thursday 2nd 16th and 30th August. For the STEAM science experiments, could we please have some help from the school community to collect some small plastic bottles (mini fizzy ones). They can be dropped off in the box outside the office. Thank you, The STEAM Team. We warmly welcome Keely Kubala and Benjamin Jonathan to our Yr 4 and 6 classes. Please hand in your netball skirts and any goal-a-thon money to the office. New to Waitaki? Do you know the Newcomers Network and Migrant Support services are available to help you make friends, connect with the community and assist with any settlement challenges? Call Christine Dorsey on 027 242 8643 or 434 7544 or email waitaki@newcomers.co.nz for more information. There are also pamphlets to give out to families and welcome packs are currently being created.